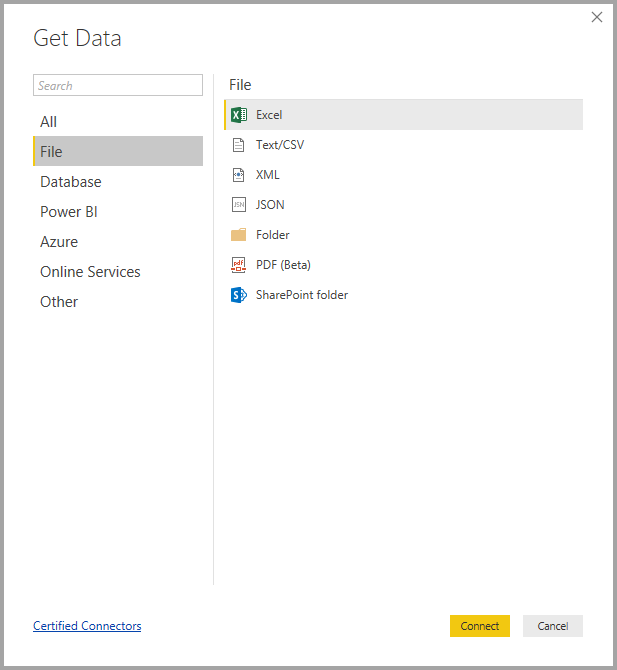 Power BI Desktop을 사용하면 다양한 원본의 데이터에 연결할 수 있습니다.With Power BI Desktop, you can connect to data from many different sources. 이 페이지의 맨 아래에는 사용 가능한 데이터 소스의 전체 목록이 있습니다.A full list of available data sources is at the bottom of this page. 가장 일반적 메뉴에서 자세히...Selecting More… 를 선택하면 데이터 가져오기 창이 표시됩니다.from the Most Common menu displays the Get Data window. 데이터 가져오기 아이콘 단추를 직접 선택하여 데이터 가져오기 창을 표시할 수도 있습니다(가장 일반적 메뉴 무시).You can also bring up the Get Data window (and bypass the Most Common menu) by selecting the Get Data icon button directly. 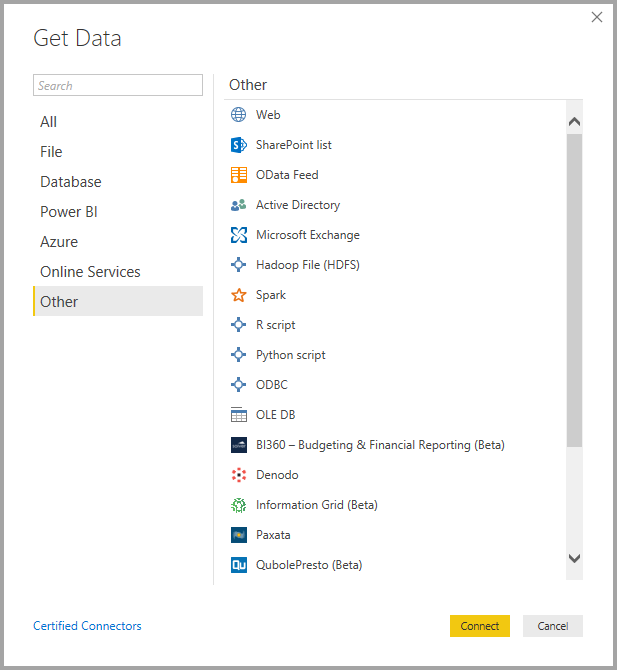 Power BI 팀은 Power BI Desktop 및 Power BI 서비스에 사용할 수 있는 데이터 원본을 지속적으로 확장합니다.The Power BI team is continually expanding the data sources available to Power BI Desktop and the Power BI service. 따라서 베타 또는 미리 보기로 표시된 작업 진행 데이터 원본의 초기 버전을 자주 볼 수 있습니다.As such, you'll often see early versions of work-in-progress data sources marked as Beta or Preview. 베타 또는 미리 보기로 표시된 모든 데이터 원본은 제한된 지원 및 기능을 가지며 프로덕션 환경에서는 사용할 수 없습니다.Any data source marked as Beta or Preview has limited support and functionality, and should not be used in production environments. 모두 범주에는 모든 범주의 모든 데이터 연결 형식이 포함됩니다.The All category includes all data connection types from all categories. 다음 그림은 파일에 대한 데이터 가져오기 창을 보여 줍니다.The following image shows the Get Data window for File. 일부 데이터베이스 커넥터는 파일 > 옵션 및 설정 > 옵션을 선택한 다음 미리 보기 기능을 선택하고 커넥터를 사용하도록 설정하여 사용해야 합니다.Some database connectors require that you enable them by selecting File > Options and settings > Options then selecting Preview Features and enabling the connector. 위에서 언급한 커넥터 중 일부를 표시하지 않고 사용하지 않으려는 경우 미리 보기 기능 설정을 확인합니다.If you don't see some of the connectors mentioned above and want to use them, check your Preview Features settings. 베타 또는 미리 보기로 표시된 모든 데이터 원본은 제한된 지원 및 기능을 가지며 프로덕션 환경에서는 사용할 수 없습니다.Also note that any data source marked as Beta or Preview has limited support and functionality, and should not be used in production environments. 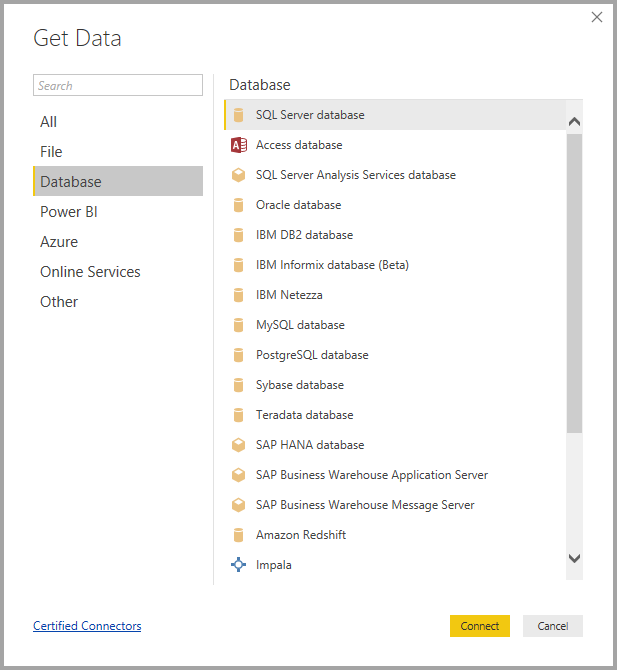 다음 그림은 데이터베이스에 대한 데이터 가져오기 창을 보여 줍니다.The following image shows the Get Data window for Database. 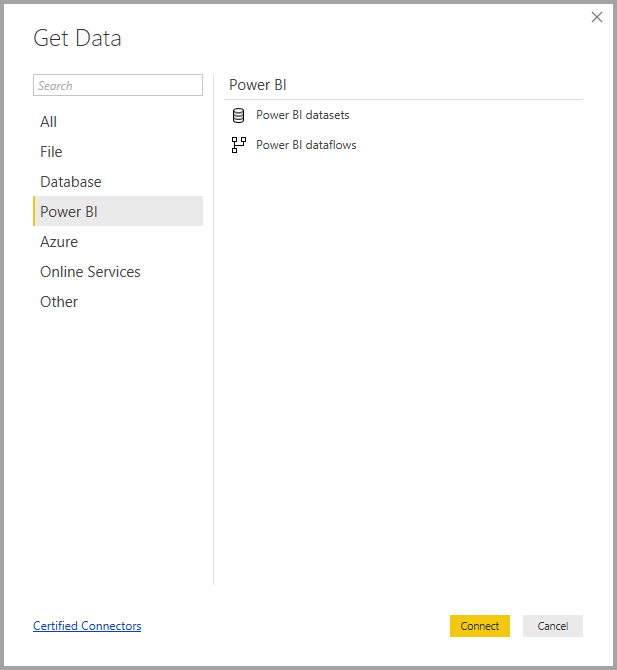 다음 이미지는 Power BI에 대한 데이터 가져오기 창을 보여줍니다.The following image shows the Get Data window for Power BI. 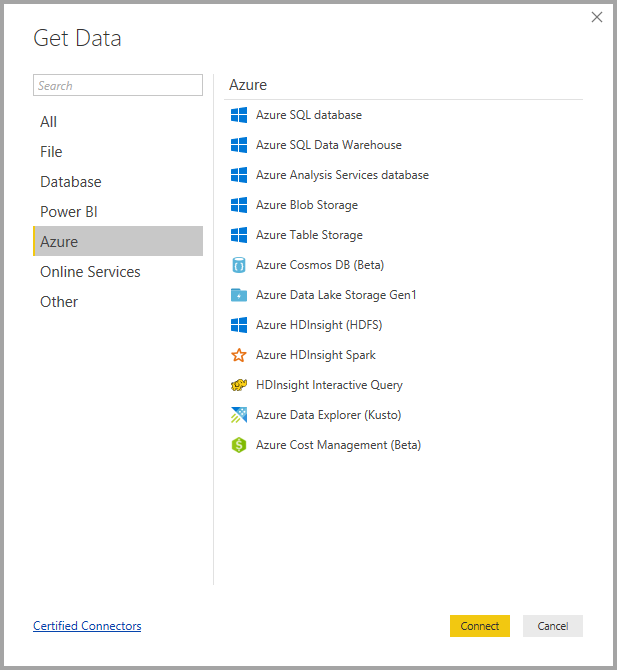 다음 그림은 Azure 에 대한 데이터 가져오기 창을 보여 줍니다.The following image shows the Get Data window for Azure. 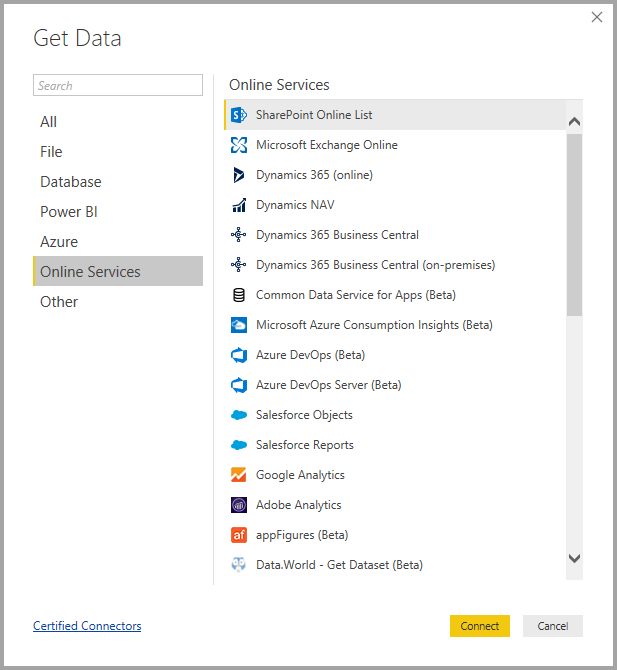 다음 그림은 온라인 서비스에 대한 데이터 가져오기 창을 보여 줍니다.The following image shows the Get Data window for Online Services. 다음 그림은 기타에 대한 데이터 가져오기 창을 보여 줍니다.The following image shows the Get Data window for Other. 지금은 Azure Active Directory를 사용하여 보호되는 사용자 지정 데이터 소스에 연결할 수 없습니다.At this time, it's not possible to connect to custom data sources secured using Azure Active Directory. 데이터 소스에 연결하려면 데이터 가져오기 창에서 데이터 소스를 선택한 다음 연결을 선택합니다.To connect to a data source, select the data source from the Get Data window and select Connect. 다음 그림에서는 기타 데이터 연결 범주에서 웹 이 선택됩니다.In the following image, Web is selected from the Other data connection category. 데이터 연결 형식과 관련된 연결 창이 표시됩니다.A connection window is displayed, specific to the type of data connection. 자격 증명이 필요한 경우 제공하라는 메시지가 표시됩니다.If credentials are required, you’ll be prompted to provide them. 다음 그림은 웹 데이터 소스에 연결하기 위해 입력되는 URL을 보여 줍니다.The following image shows a URL being entered to connect to a Web data source. 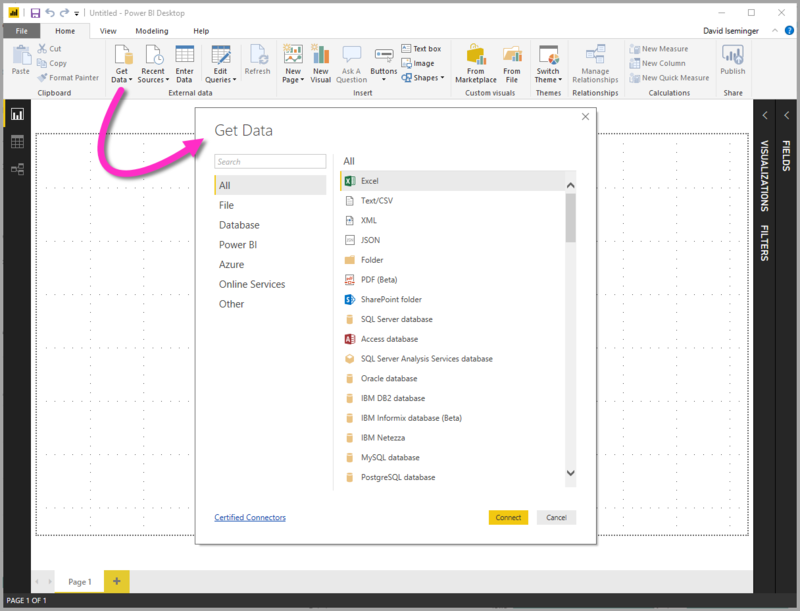 URL 또는 리소스 연결 정보를 입력한 경우 확인을 선택합니다.When the URL or resource connection information is entered, select OK. Power BI Desktop이 데이터 소스에 연결하고 탐색기에 사용 가능한 데이터 소스를 제공합니다.Power BI Desktop makes the connection to the data source, and presents the available data sources in the Navigator. 탐색기 창의 맨 아래에 있는 로드 단추를 선택하여 데이터를 로드하거나 편집 단추를 선택하여 데이터를 로드하기 전에 쿼리를 편집할 수 있습니다.You can either load the data by selecting the Load button at the bottom of the Navigator pane, or edit the query before loading data by selecting the Edit button. 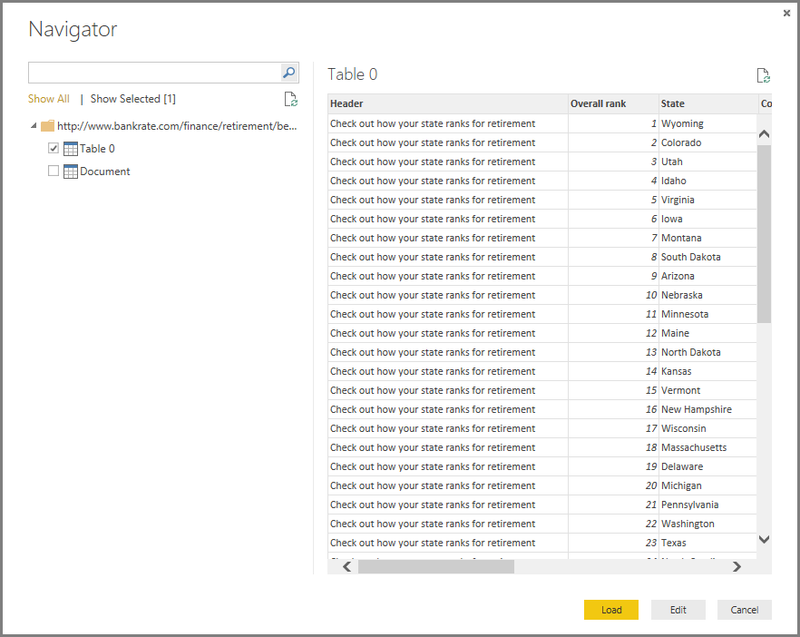 Power BI Desktop에서 데이터 소스에 연결하는 데 필요한 작업을 마쳤습니다.That’s all there is to connecting to data sources in Power BI Desktop! 데이터 원본의 성장 목록에서 데이터에 연결을 시도하고 자주 확인하세요. 항상 이 목록에 계속해서 추가합니다.Try connecting to data from our growing list of data sources, and check back often - we continue to add to this list all the time. 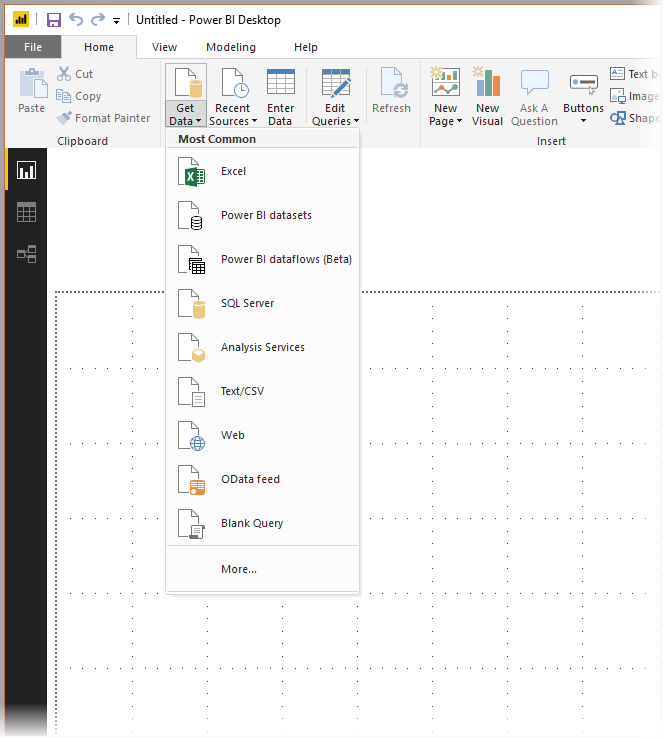 Power BI Desktop이란?What is Power BI Desktop?